A Tauntaun is a Star Wars bipedal creature found on the snow/ice planet of Hoth first released in 2009. Han Solo was seen riding one of these before the Battle of Hoth. Many of them were killed by Wampas invading Echo Base. 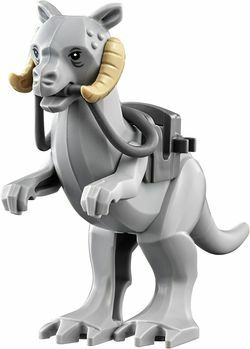 In the video games LEGO Star Wars: The Complete Saga and LEGO Star Wars II: The Original Trilogy, the Tauntauns, unlike other creatures, did not move independently, requiring a rider for motion. This page was last edited on 15 July 2016, at 10:15.